On Thursday, the UFC announced the seventh international edition of “The Ultimate Fighter” will feature a cast of 16 undiscovered professional mixed martial arts fighters from across 19 Latin American countries. “Latin America has become a huge market for the UFC and we’re excited to take it to the next level with The Ultimate Fighter,” said UFC Senior Vice President of International Development and General Manager of Latin America Jaime Pollack. “With the successful launch of the UFC NETWORK, and the tremendous growth of our fan base, our focus has now moved to finding and developing the top talent in this market. As customary, the reality show features the contestants living together in the TUF house and follows them as they train and compete against each other for a six-figure UFC contract. The series will be shot in Las Vegas this spring. Coaches and broadcast details will be announced shortly. Eligible candidates must be between 21 and 34 years old, speak Spanish, have a minimum of three professional MMA fights, and hold a verifiable winning record. They must also be citizens of one of the following countries: Argentina, Belize, Bolivia, Chile, Colombia, Costa Rica, Dominican Republic, Ecuador, El Salvador, Guatemala, Haiti, Honduras, Mexico, Nicaragua, Panama, Paraguay, Peru, Uruguay and Venezuela. All fighters are now invited to register at: www.ufcnetwork.com. Mexico-born Efrain Escudero captured the Season 8 lightweight tournament, while Mexican-American Diego Sanchez was the first winner of the franchise, defeating Kenny Florian, a fighter of Peruvian descent, at The Ultimate Fighter 1 Finale in 2005. 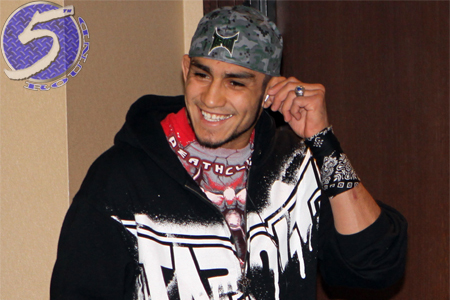 Other Mexican-Americans to follow in his footsteps include Season 13 winner Tony Ferguson (pictured) and Season 17 victor Kelvin Gastelum.